Wow! Isn't that a discovery. While browsing old images by Steve McCurry taken in Lebanon in 1982 in the middle of the civil war, I fell on this gem. Druze students in the Chouf area are studying under a painted image which turned out to be Martine (by Casterman, collection Farandole) herself, with a smal twist: She is veiled. 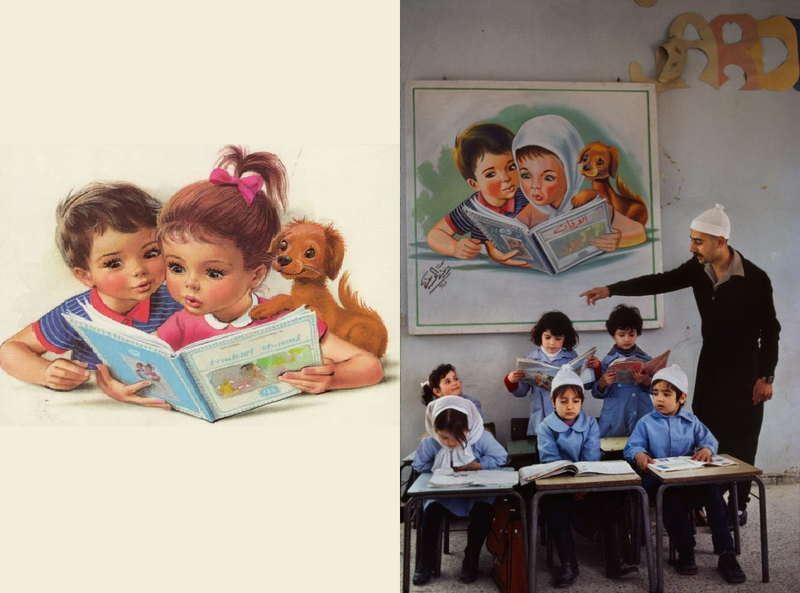 Yes, she is surrounded by Jean her brother and Patapouf her dog, but the image which usually adorns the backcover of the children's series sees her wearing a traditional Druze white scarf (much like the female student in the first row of the students depicted in McCurry's image). Since Martine was not famous in the United States from which McCurry hails it is indeed a stoke of luck for McCurry to have captured this image without most likely realizing the origin of the painting hanging above the kids. For such moments I live!